There are cooks and there are cooks – such a profound statement. My experience has shown me that there is a place for numerous levels of skill and commitment in our profession. People do need to eat, and in this regard all restaurant cooks provide a valuable and important service. On the other hand, there are some cooks who view their position as something all together more significant. I have always admired that fast, efficient, consistent breakfast or short order cook who can multi-task and address a relentless stream of orders, flipping perfect eggs over easy, golden brown pancakes, crispy and salty home fries, perfectly cooked hamburgers and grilled sandwiches, and crisp luncheon salads without even breaking a sweat. Their skill level is impressive and sometimes even surpasses the ability of the chef. They fill a real need in our business and are uniquely qualified to hold their title – but there is still a level of dedication that goes beyond this. I am in awe of line cooks who are methodical and predictable. You know, the cooks that complete a massive list of mise en place before service are as organized as a general, as consistent and fast as Speedy Gonzalez, and gifted with a palate that would marvel the most dedicated sommelier. But, there is a level of dedication that even surpasses these highly accomplished line pirates. There are restaurants and there are restaurants – this reality provides those opportunities for cooks at various levels to contribute and find a home. I have always enjoyed those breakfast joints with the full array of traditional morning dishes that fly off the griddle or from egg pans without a hitch. There is a restaurant called the Evergreen in NYC – somewhere around 45th and 7th (Greek, of course) where you can be seated, order eggs over easy with home fries and bacon, coffee and juice and find the plate dropped in front of you only seconds after the waiter dots the I’s. I remember the breakfast selling for $6 and just how excellent the simple order was made and presented. I also relish those opportunities that I have had to enjoy a 7 course meal at one of the country’s most admired restaurants where dinner would take 3-4 hours, the wines were paired with exceptional thought, and each bite made me pause and give thanks for the skill of the cook. There are restaurants and there are restaurants. They are all important, and they all have a place in the eco-system of the food business. What is most interesting is the approach that cooks take with the cards they are dealt, the position they hold, the responsibilities on their shoulders, and the expectations that others have with regard to their performance. It is this approach that truly defines whether or not they are serious about cooking. What does a serious cook look like? Serious cooks understand that their most valuable asset is the level of unique skill brought to their restaurant. It is the responsibility of the individual to work consistently at bringing those skills to the next level. To this end, the serious cook is focused on finding ways to improve through work with other accomplished cooks, attending workshops and classes, reading cookbooks and articles by accomplished chefs, and constantly practicing. Confidence comes from competence – competence comes from commitment. A serious cook needs to establish a baseline of excellence to aspire to. Benchmarks of excellence are all around us and the serious cook seeks out opportunities to experience those benchmarks and adopt what is possible into his or her own repertoire. This may involve volunteering to work with accomplished individuals, participating in competitions designed to push individuals forward, signing up for a stagiere opportunity on a day off, or simply saving the funds to dine out at a restaurant of renown as part of research and development. You can pick out serious cooks from the crowd. Serious cooks look and act the part – always. Serious cooks boast pristine uniforms, proper grooming, professional interactions with others, possess good listening skills, are methodical and organized at work, exude efficiency and remain zeroed in on excellence regardless of the task. They tend to always build people up and not tear them down; offering advice and critique with the addition of coaching and demonstration that leads to better results in the future. Serous cooks know that nothing worthwhile comes easy and that skill building requires a real investment of time. As is the case with a professional musician or athlete, the greatest tool for reaching a level of excellence is that investment of time. There is no real shortcut to becoming a serious cook. THEY ARE ALWAYS READY FOR MORE – WHAT’S NEXT? Serous cooks are hungry to learn and excited to contribute. They understand that the way to advance their career is to be an aggressive learner and give more than they receive. 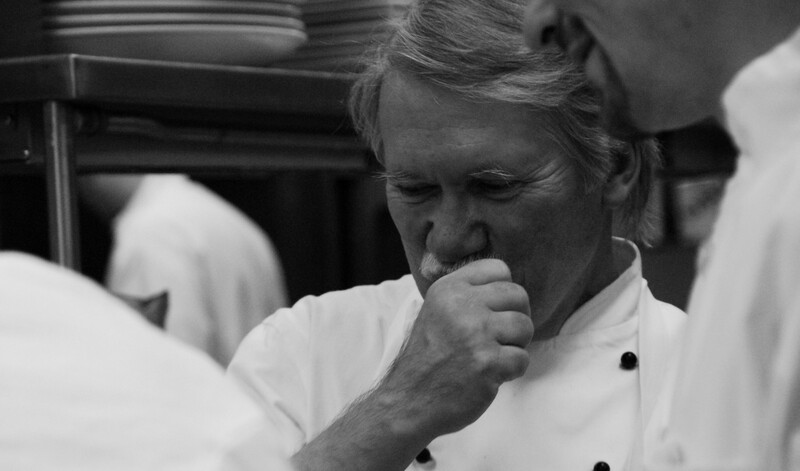 Serious cooks become the example in a restaurant that others seek to emulate. The way they carry themselves, how they interact with others, the seriousness with which they handle and respect food, their unwillingness to accept mediocrity, and their commitment to constant improvement sets the tone for the entire operation. Serious cooks perform this way because they don’t know any other acceptable approach towards the profession. You will note that serious cooks can be very hard on themselves. A mistake that was a result of their lack of focus or under-developed skill set will haunt them, but they will quickly throw back their shoulders and figure out the right way to ensure that that mistake doesn’t happen again. A plate of food that is returned from the dining room will keep the serious cook up for many nights. The serious cook is certainly focused on building skills, but he or she also understands that great cooking must go beyond the physical act. The way to move from acceptable to good, and good to great is to “know” cooking and “know” the dish in question. The serious cook studies the dish, the ingredients, and the traditions behind the way a dish is prepared. He or she works at building a palate for the way a dish was meant to taste, and an eye for how it was meant to look. The serious cook will practice, practice, and practice even more until the preparation of a cuisine or particular dish is deemed “proper”. You will also recognize the serious cook as someone who spends time with other serious cooks and avoids building counter-productive friendships that might get in the way of a commitment to excellence. Ask a serious cook who his or her friends are and he or she will count through a list of others with the same level of passion. Serious cooks cook seriously. This is not a job, not a series of tasks that must simply be finished – this is a lifetime commitment to a craft that is or will be an extension of who they are. Whether an artisan bread baker, cake decorator, line cook, savory chef, garde manger, chef competitor, ice carver, fishmonger or butcher – the serious cook is easy to spot. Whether a short order cook at a local diner or a chef de partie at a 3-star Michelin restaurant – the serious cook can find a home.